You have to experience Namibia’s evocative semi-arid and desert landscapes for yourself to truly appreciate the extraordinary beauty and soulfulness of this fascinating, wide-open country. You can sit back and relax in the luxury vehicle as you range from the Kalahari Desert with its antique red sands to the gigantic 100-mile long ravine of the Fish River Canyon. 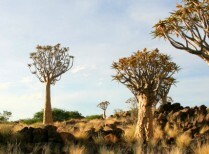 Experience the Namib, a vast and picturesque coastal desert stretching 1 200 miles along the Atlantic Ocean. Leaving Windhoek, we travel into the Kalahari Desert. Enjoy the opportunity to experience the red dunes, wildlife and plants in this desert environment on an optional nature drive. Intu-Afrika Camelthorn Lodge is in a secluded valley between two red dunes and hidden amongst ancient camelthorn trees in the Kalahari Game Reserve. The lodge consists of a thatched main building, dining area as well as a boma that overlook a natural stone pool. Canyon Village lies a short distance from the Fish River Canyon, at the foot of a rock face, and the main building is built into a massive granite boulder. The Lüderitz Nest Hotel is set directly on the bay in the Namibian town of Lüderitz. You have access to a private tidal beach and walk-on jetty as well as easy access to the town’s amenities and attractions. 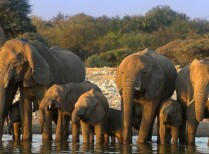 Elegant Desert Lodge is a welcome sanctuary with its own waterhole where a range of wildlife come to drink. The lodge has its own Lapa bar and restaurant where authentic cuisine is savoured. There is also the opportunity to do both guided and unguided walking tours, quad biking and half day Sossusvlei excursions. Nearby the Atlantic Ocean on the border of the Skeleton Coast Park is the unique and scenic Beach Hotel Swakopmund, which prides itself immensely on its rooftop terrace where it is possible to witness breathtaking 360° views over the city, Swakop River, dunes and ocean. The hotel further boasts an in-house restaurant and bar with a proud WW1 history and sundowner deck. Intu-Afrika Camelthorn Lodge is in a secluded valley between two red dunes and hidden amongst ancient camelthorn trees in the Kalahari Game Reserve. The lodge consists of a thatched main building, dining area as well as a boma that overlook a natural stone pool. The lodge’s décor takes its decoration inspiration from African Bushmen, one of the oldest cultures in the world. At this exceptional lodge you will have the chance to walk around the Kalahari with a bushman tracker and immerse yourself into a dramatically wild landscape. You will have the opportunity to learn and study their desert survival secrets and hear about the history of the people. Canyon Village is a short distance from the Fish River Canyon, the largest canyon in Africa and the second most visited attraction in Namibia. This lodge lies at the foot of a rock face and the main building is built into a massive granite boulder. This is where you will see murals that depict the daily life of the region’s early inhabitants: the Bondelswart-Nama. There is a bar and restaurant to relax in and appreciate this dramatic landscape and its historical wonders and natural beauty. On your arrival you will be greeted by a cart drawn by mules that will take you and your luggage to your chalets. 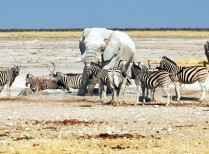 Take a walk on the Namibian wild side. The Lüderitz Nest Hotel is set directly on the bay in the Namibian town of Lüderitz. You have access to a private tidal beach and walk-on jetty as well as easy access to the town’s amenities and attractions. The hotel makes for a great base when exploring the attractions and activities surrounding the town, whether that is catamaran tours, fishing, desert explorations, hiking, biking and more. Those wanting to indulge in some pampering treatments can book at the nearby day spa or just spend some time on the private beach, around the swimming pool or on the balcony of their luxury room enjoying endless ocean vistas. Elegant Desert Lodge is a welcome sanctuary during a wild Namibian adventure. The lodge has its own waterhole where a range of wildlife come to drink and there is an opportunity to do both guided and unguided walking tours for a more intricate insight into the landscape. Other activities in this region include quad biking and half day Sossusvlei excursions. The lodge has its own Lapa bar and restaurant where authentic cuisine is savoured. 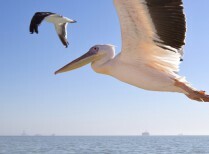 Nearby the Atlantic Ocean on the border of the Skeleton Coast Park is the unique and scenic Beach Hotel Swakopmund. It is ideally located within walking distance to the charming town of Swakopmund, and as a base to see the surrounding area on a desert tour, quad bike, hot-air balloon and more. Beach Hotel Swakopmund prides itself immensely on its rooftop terrace where it is possible to witness breathtaking 360° views over the city, Swakop River, dunes and ocean. The hotel further boasts an in-house restaurant and bar with a proud WW1 history and sundowner deck. On the fourth floor, you can meet up at the lounge bar to watch a stunning sunset while sipping on your favourite drink. There are also many opportunities to indulge in invigorating and detensifying massages, such as the Hot Lava Shell Massage.